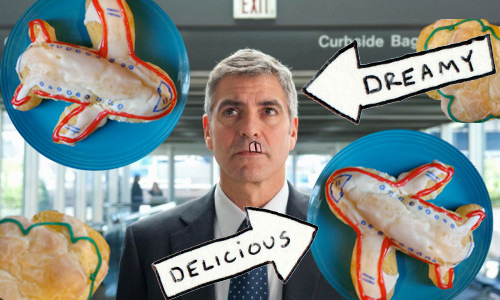 Up in the Air, or as I like to call it, that movie with George Clooney and airplanes, is a bittersweet tale of a dude who leads a largely empty life, traveling around the country for a job where he fires people, never really cultivating any real bonds or finding any real fulfillment. Oh, George. Clearly, you don't know that so many voids can be filled with delicious eclairs, and so I'd like to present a sweet cinematic pairing: Up in Eclair. In deference to the film, the pastry is light as air and shaped like the planes which permeate the plotline. The lemon filling is sweet with a tinge of sour as a nod to the bittersweet story, and for your eating pleasure, the icing on top brings it all home for a sweet ending.